Altro Flooring and Walling introduces Altro Whiterock Wall Designs, a new range of wall products that combines style and strength to transform diverse interior environments. Developed in response to market needs, Altro Whiterock Wall Designs is the perfect combination of elegant aesthetics and great function in a single product. Altro Whiterock Wall Designs are ideal for general circulation areas as well as non-critical hygienic wet environments such as bathrooms and spas. 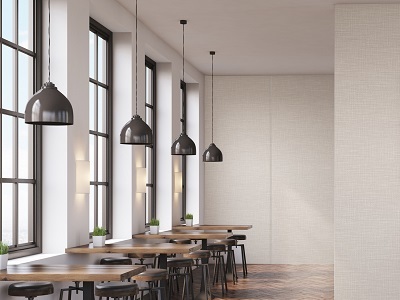 The variety of design options means there’s a wall product to suit any design aesthetic while the smooth impervious surface – fitted like an Altro Whiterock sheet – means minimal maintenance is required to retain the original appearance. The new Altro Whiterock Wall Designs complete the Altro product suite for floors, walls and doors to deliver a total project solution. Designers, specifiers and end users have an extensive colour palette to create stunning, coordinated interiors. All products are backed by Altro’s industry leading technical support, customer service and quality guarantees. Whatever your design aesthetic, there’s an Altro Whiterock Wall Design to fit your expectations. From striking and contemporary to calming and natural, your interior spaces are brought together with Altro Whiterock Wall Designs. Select from the warm character of natural wood, the cool vibe of stone, the textural feel of linen or the chic reflection of metallics. The seamless application eliminates unsightly lines while thermoforming of corners provides an uninterrupted flow. The striking visual appeal of Altro Whiterock Wall Designs combined with excellent scratch and wear performance will ensure your walls will continue to look good even in the harshest of conditions. Embrace nature in your interior spaces with Altro Whiterock Woodgrains bringing both warmth and richness to the design palette. The Woodgrains suite of Soft, Warm and Rich options ensures there’s a tone to suit the design and purpose of any interior environment. When your design brief seeks interiors with understated interest and texture, the family of Altro Whiterock Weaves in Summer, Autumn and Winter tones provides the answer. Dress it up or dress it down with Weaves’ subtle pattern complementing other materials to deliver a sophisticated and elegant space of warmth and comfort. Add some bling to your interiors with Altro Whiterock Metals. Whether it’s a gleaming slice of contrast or a bold statement wall, Altro Whiterock Metals in Antique Copper and Brushed Steel deliver the desired design outcomes. Coordinate with rustic elements to bring out an industrial edge, or pair with clean lines to create a cool city vibe. Either way, the Altro Whiterock Metals collection is one of the easiest ways to infuse style, glamour and interest into any interior environment. With 11 designs to select from, there’s an Altro Whiterock Wall Designs product for every use. The collection has a subtle texture to add a touch of realism while maintaining its hygienic properties. Matching silicone sealants are available, as well as five co-ordinating trims.